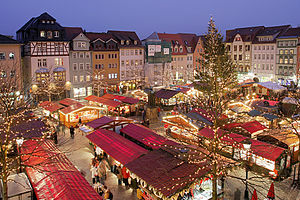 Christmas celebrations in Germany start on November 11 with the celebration of St. Martin’s Day. St. Martin’s Day remembers Martin, a Roman soldier, who, when riding through the countryside on a cold day, met a beggar asking for alms. Martin had nothing on him to give but, noticing that the beggar was cold, took his cloak and cut it in two pieces and gave one piece to the beggar. That night, after Christ appeared to him in a dream, Martin devoted his life to service to God. On St. Martin’s Day children receive small gifts and eat treats, mainly currant buns. They make homemade lanterns out of cardboard and transparent colored paper. Some of these lanterns are quite intricate. They hang the lanterns on long poles and march through town. After the procession the people reenact the legend of St. Martin. On November 30, St. Andrew’s Night is celebrated. Young girls, before retiring for the night, may perform rituals to predict the identity of their future husbands. About four weeks before Christmas, approximately December 1, many Germans observe the first Sunday of Advent. Advent is a time of introspection and preparation looking forward to the birthday of the Christ child. It is observed during the four Sundays before Christmas. On St. Barbara’s Day, December 4, early budding cherry branches are cut and put in a warm place to bloom for Christmas. Children look forward to December 6, St. Nicholas’s Day. St. Nicholas visits all the children of Germany along with an assistant, either Black Peter or Krampus. St. Nicholas arrives riding a white horse not a sleigh pulled by eight reindeer and is a stern man not jolly. St. Nicholas gives gifts, candy, and treats to all the good children while Black Peter or Krampus gives switches to the naughty children. On the 13th of December children gather and parade through town singing carols. At the end of the parade route they perform a play about the Nativity. On December 21, St. Thomas’s Day, the air is filled with the aroma of rich fruitcakes baking. After all the baking is finished the people gather to dance the night away. The big Christmas celebration begins on December 23, the Eve of the Eve. It is said that the Virgin Mary and flights of angels fly overhead bringing advanced word of the Christ child’s birth. On Christmas Eve, December 24, the Christmas baking is done, presents are wrapped and distributed, and the Christmas tree is decorated. Children leave lists of gifts they wish to receive on the window sills for the Christ child, the Christmas gift giver in Germany. The main dish for supper on December 24 is carp. Brass bands serenade passersby with Christmas carols, and people attend midnight church services. On Christmas day Catholic and Lutheran families attend church services. Goose is the meal of choice, and families spend time with each other. December 26 is St. Stephen’s Day, and December 28 is Holy Innocent’s Day. Holy Innocent’s Day remembers the slaughter of the children of the Bethlehem area by King Herod. On that day children pretend to swat adults with switches and are placated with small presents. Traditional foods served on December 31, New Year’s Eve, are carp, a hot spiced punch called sylvesterabend served with pfannkuchen (doughnuts), and balbauschen, a fried cake stuffed with raisins and currants. People also attend early evening church services. Epiphany (January 6), also known as Twelfth Night or Festival of the Three Kings, is celebrated by eating Kings cakes. Kings cakes are baked with a bean inside. The one who finds the bean becomes king of the feast and is allowed to give ridiculous orders to those around him or her. The final night of the Christmas season comes on January 13 and is known as Octave of Epiphany. Groups of four boys each march around town singing “star songs.” One boy carries a lighted star on a pole while the others are dressed as the three kings. Some groups carry a crib filled with good things to leave with a needy family.